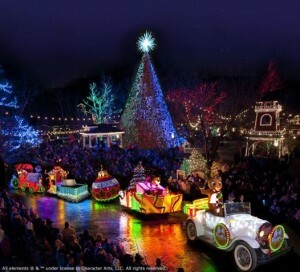 Nearly everyone agrees: Christmas is the best time to visit Silver Dollar City. An Old Time Christmas has been transforming the park every year for over twenty years now, long before it was a trend at other parks. Silver Dollar City’s world-renowned charm mixes with the magic of Christmas as the city dons a staggering 6.5 million lights. That’s 1.5 million more than last year thanks mostly to the amazing new Christmas in Midtown display that turns light displays up a notch. Additionally, you can’t miss the famous Christmas parade, Broadway-quality Christmas shows, the Christmas carol sing-along steam train, meeting Santa, and much more!